Typical co-op buyer financial requirements in NYC include 20% down, a debt-to-income ratio between 25% to 35% and 1 to 2 years of post-closing liquidity. Debt-to-income is a measure of what percentage of your income goes towards housing expenses (mortgage and maintenance payments) and other debts. Post-closing liquidity is a measure of how much in liquid assets you have after making your down payment and accounting for buyer closing costs. The financial requirements for buyers of co-ops in NYC are typically much stricter than the lending guidelines for banks. This means that a typical buyer in NYC can usually afford a higher purchase price for a condo or a house compared to a co-op. In practice, most buyers shopping for a primary residence still opt for co-ops since they’re up to 40% cheaper than comparable condos in NYC. The exact buyer financial requirements vary by co-op building in NYC. It’s not uncommon for stricter co-ops to require a down payment of 30% or more, a debt-to-income ratio as low as 25% and post-closing liquidity well in excess of two years. In the most extreme cases, some co-ops require buyers to have two times the purchase price in liquid assets post-closing. Conversely, some co-ops have very flexible financial guidelines for buyers if any. A seasoned buyer’s agent can help you identify which co-ops are a good fit for you financially. The strictness of a co-op’s buyer financial requirements is typically correlated with how rigid or flexible a co-op’s sublet policy and other rules are. What Are the Typical NYC Co-op Financial Requirements? What Is the Average NYC Co-op down Payment Requirement? What Is the Post-Closing Liquidity Requirement for NYC Co-ops? How Is Post-Closing Liquidity Calculated? What Is the Typical Co-op Board Debt-To-Income Ratio? How Is the Debt-To-Income Ratio Calculated? Is Gifting Permitted When Buying a Co-op in NYC? Are NYC Co-op Financial Requirements Flexible? Most New York City co-ops require at least 20% down, a debt-to-income ratio of approximately 25% and one to two years of post-closing liquidity. 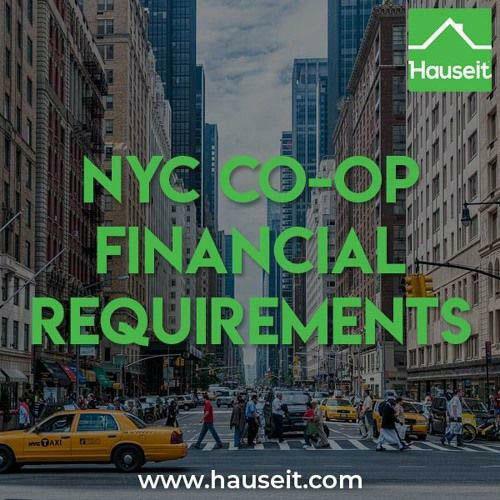 Co-ops in NYC have notoriously strict financial requirements which include a large percentage down as well as a required minimum debt-to-income ratio and post-closing liquidity requirement for applicants. The most conservative co-ops require between 20% to 50% down, a debt-to-income ratio of 25% to 30% and two or more years of post-closing liquidity. Keep in mind that the exact financial requirements vary by building, so this is something you’ll need to consider during your search. 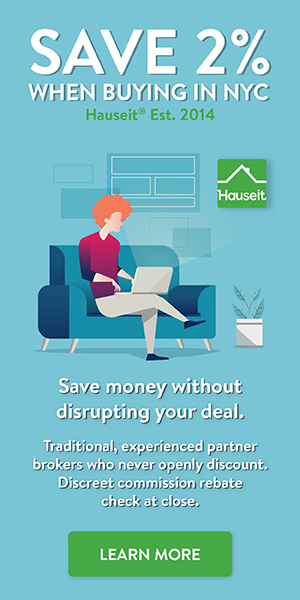 Partnering with a seasoned buyer’s agent on your search will allow you to more easily learn and interpret the various financial requirements of the co-op buildings you consider. You can also save thousands on your purchase by requesting a buyer closing credit from your buyer’s agent. We explain each of these requirements in greater detail below, however the key thing to understand as a potential NYC co-op buyer is that co-ops typically have financial requirements which are much stricter than those of lenders. This means that the simple fact you have a pre-approval letter from a major bank does not guarantee that a co-op will accept you into the community. Pro Tip: There are a number of pros and cons when comparing co-ops and condos. The benefits of buying a co-op include lower buyer closing costs and a lower purchase price. Read our extensive comparison of co-ops and condos in this article. The combination of strict financial requirements, a challenging board package and co-op interview process, greater subletting restrictions and more rules are some of the key explanations as to why co-ops in NYC are typically 10-40% less expensive than condos. Despite the aforementioned challenges, co-ops typically work well for buyers who plan on remaining in NYC because you can get more for your money and they offer a stronger sense of ‘community’ compared to condos. The most common down payment requirement for a co-op in NYC is 20%. Because each co-op is a private corporation, buildings can set their own rules regarding down payments and other financial requirements. Co-ops also have different approaches to how the board reviews purchase applications, how frequently the meet and how long the entire board review process takes from start to finish. Although down payment requirements vary by building, the chances of finding a co-op that is okay with less than 20% down are incredibly low. Other common down payment requirements in NYC for co-ops are 25%, 35% and 50%. In some cases, a co-op’s policy will ‘permit’ a loan up to a certain loan to value (50% LTV, for example) however in practice the building and even the listing agents will discourage it and effectively require an all-cash purchase. Confused about closing costs for co-ops vs. condos? Read our complete NYC condo vs. co-op closing cost comparison. You may occasionally stumble upon a co-op building which permits 10% down, but this is an exception rather than the norm. We do not recommend that you begin a NYC co-op search with the desire to put down just 10% because of how uncommon it is to find a building that permits less than 20% down. A typical co-op in NYC requires applicants to have approximately 1 to 2 years of post-closing liquidity after accounting for the down payment and closing costs. The simple fact that you have enough money for the down payment and closing costs does not mean that you will pass the financial requirements of a co-op in NYC. Post-closing liquidity estimates for how many months/years your liquid assets will be able to cover your monthly mortgage and co-op maintenance payment. Co-ops like buyers to have a good amount of post-closing liquidity because it reduces the risk that a buyer may stop paying maintenance. When a unit owner stops paying maintenance, it increases the financial strain on fellow owners and makes it more difficult for banks to lend in the building. In the example above, the candidate has just over 1.5 years of post-closing liquidity to his or her name. Because the buyer in this example is making an all-cash purchase and there is no mortgage payment, the monthly carrying costs will be significantly lower. The buyer’s post-closing liquidity is therefore significantly higher at just under six years. Liquid assets always include cash, CDs and money market funds. Liquid assets almost always include brokerage accounts. Liquid assets sometimes include retirement accounts such as a 401K, SEP IRA, Roth IRA or a Traditional IRA. Liquid assets never include unvested stock, real estate, personal property and insurance policies. The definition of ‘liquid assets’ is open to interpretation and varies by co-op board. As a general rule of thumb, any asset which can be converted to cash in 24 hours is considered liquid. Listing agents and sellers will be able to compute your post-closing liquidity by analyzing the REBNY financial statement which you will include with the rest of your offer documentation when submitting an offer on a co-op in NYC. The typical debt-to-income ratio for a co-op in NYC is between 25% to 30%. There are always exceptions, and many co-ops do not even have a stated rule / official policy regarding debt-to-income ratio or post-closing liquidity. Considering that sellers pay all real estate commissions in NYC, hiring a buyer’s agent to help you navigate the complexities of co-op financial requirements (and the board package) is a no-brainer. Aside from the debt-to-income ratio itself, co-op boards also consider your employment track record and multi-year income history. Boards like to see a history of consistent employment and stable or rising income for at least the past three years. If you work in finance and rely on a large annual bonus, a board will likely want to see that you’ve received a bonus for at least two consecutive years before including the bonus amount in the debt-to-income calculation. Pro Tip: Lenders typically require at least two years of bonus history before they are willing to lend against bonus or commission income. Otherwise, they will underwrite your loan solely based on your base salary. If you are self-employed, you will likely need to show at least 3 years of business income history and provide a notarized letter from your accountant in the board package. It’s worth mentioning that many co-op boards will take a more holistic approach to analyzing your financials. What that means is if your debt to income ratio is slightly above the target (31.5% vs. 30%, for example) but you have substantial post-closing liquidity (i.e. 5 years) and strong employment history, the board will approve you anyway. The debt-to-income ratio is calculated by dividing your monthly mortgage and maintenance (as well as other debt payments) by your monthly income. When calculating the debt-to-income ratio, you must compute your total income including wages, dividend income, rental income and stipends. For monthly liabilities, you must include all existing liabilities (such as student loan or car payments) in addition to the maintenance and mortgage payment (if applicable) for the co-op unit you are buying. Sometimes. Gifting policies vary by co-op building. Most co-ops will permit a reasonably sized gift from a family member, as it will improve your post-closing liquidity and reduce the financial risk to the co-op. If a co-op building does permit gifting, you will be required to include a signed gift letter along with your board package. Pro Tip: Your bank will also require you to prepare a signed gift letter if you’r receiving a gift. In some cases, the co-op will allow you to include the same gift letter you prepared for the lender as part of the co-op board package. A co-op may also have its own specific gift letter template, in which case you’ll need to prepare separate gift letters for your bank and the co-op. It’s worth mentioning that receiving a gift for the entire purchase price is technically considered ‘parents buying for children’ or ‘children buying for parents’ as opposed to receiving a gift. A co-op which permits gifting may not permit parents buying for children or vice versa. We, [John Smith], are making a bona fide gift of $[100,000] to our [Friend/Daughter/Sister, etc.] [Sarah Smith] for the purchase of property located at [222 East 11th Street]. It is expressly understood that this is an outright gift and not a loan in any form, and that repayment either in the form of services or cash is not expected at this time or at any time in the future. I/We further certify that the funds to be used for this gift were not provided by anyone who directly or indirectly has any financial interest in the sale and conveyance of the above-mentioned property. Sometimes. A co-op will never show flexibility on the down payment requirement. However, some boards are more flexible in their review of your debt-to-income and post-closing liquidity metrics. Boards which do not have specific financial targets in mind will often review candidates more holistically. Under this type of board, a qualified candidate is typically one who shows a clear and consistent monthly positive cash flow and the ability to comfortably cover his or her financing and maintenance payments. In a situation where an apartment requires a gut renovation, a board may be even stricter than usual in reviewing an applicant’s finances. Renovation work is often subject to cost and time overruns. Therefore, a board wants to be sure that your post-closing liquidity will look good even if the renovations go way over budget. If a board is not convinced of your ability to withstand construction cost overruns, the board may request that you place a certain amount of money in escrow until renovation work is complete.